I have been re-arranging and organising some of my photographs on the site today. In a bid to ease the effort it really would take to maintain this site I am moving all my online photographs to Flickr. I have been using Flickr for a number of years and my installation of Gallery on this site had not been used for a long time. So, shortly, the domain for photos.curnow.org will point to a new page about my photographs. As a result I realised that I had not created the mobile set for 2006. In recent years I have been collating photographs taken with my mobile ‘phone camera into a story board for the year. In 2004 I selected 100 but for 2005 I only managed 50. In 2006 I was again able to select 100 images that told a brief story of the year. You can see the 2006 set at Flickr. The last couple of sets were illustrated by the inclusion of thumbnails of each picture. I decided against that this year and instead created a mosaic to showcase a random selection from the 100 best mobile picture. 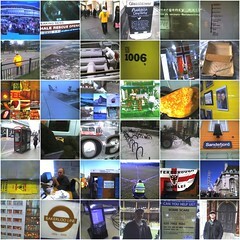 So, the mosaic is a brief selection of the 100 mobile pictures that tell the story for 2006. Click here for the full set and feel free to comment the set at Flickr.